One of the best ways to grow and develop an online business is to look at building out your own niche site. It is one of those businesses that lets you learn a bit on the fly, invest a lot of sweat equity and when you learn the formula, you can usually repeat the process. There are two pillars to my Authority Matrix program – one is building an authority site around your own brand or business and the other is building out a niche site business from the ground up. Both are great models, but today, I want to talk a little bit about the niche site path to success. The idea for this post came from a Facebook Group (the tree that keeps bearing so much fruit it’s crazy) where a woman asked the 12,000+ audience of digital marketing people about a deal to buy a web property that her friend was considering. The site in question was primarily an Amazon affiliate site, was generating about $3000 (she didn’t say if that was profit or revenue) and the seller was looking for about $120,000 sale price. It wasn’t a very nuanced answer, pretty much 90% of the people who replied were somewhere between dismissive and outraged that such a “dramatic valuation” had been given to that website that they’d never seen before. There’s something about my personality that when I see that much stupid on display in one location, I almost have to drop an “anti-stupid” bomb into the mix to see what the fallout is. I replied to the crowd that actually, on most website brokerage marketplaces of any quality, a site will fetch somewhere between 25x and 40x its monthly income, where the income is based on a 12-month rolling average. That’s totally true. If you go to Empire Flippers and check out their valuations, that kind of valuation range is par for the course on an established site with a white hat link profile. If the site has strong social media profiles, an email list of a decent size and good quality content, then it will be at the higher end of that range and if it is just a straight up affiliate site with maybe some shady links and in need of a bit of content work, then it will be on the lower end of that range. The reality is, the reaction of the mob just shows their general level of ignorance of the market and puts their scarcity-driven, short-term mindset on display. Well, think about it… If you could buy an established business for three years worth profit, you’d probably seriously consider it. That’s actually a fairly reasonable valuation in terms of traditional businesses. For example, a wind farm sells for 10x EBITDA and a commercial printer sells for about 3x – can you think of a more antiquated business model than a commercial printer? Unless you’re talking about buying a record store or a Blockbuster Video, a printer is about as old school as you can find. In fact, if you look at tech companies, they have just absurd valuations compared to traditional businesses. So, I don’t think a 4x or 5x EBITDA valuation for a niche site is too far off the mark and more importantly, neither does the market because that’s what is actually happening. But people who don’t know any better will make absurd comments because their thinking is stunted. My favourite comment came from the person who said that the original poster’s friend could simply take the $120,000 and build out their own niche site that would generate that much income per month. That person’s comment was literally based on nothing. It was entirely ignorant. These are the kinds of people who lose their money in Bitcoin. I’m going to try and change your thinking around this type of business model. First of all, what you’re doing is that your building/buying/investing in a web property. I think the best way to think about your niche site business is like being a property developer that builds commercial properties. You’re establishing a portfolio of commercial web properties. Secondly, there is a formula to this model. You can learn a bunch of stuff (keyword research, content strategy, link building, etc) and the actual niche itself then becomes plug’n’play – you can go into other markets and repeat the process. Thirdly, you don’t need a bit initial chunk of change to drop into the startup phase of the development because you can poor sweat equity into it. If you’re willing to do a lot of the work yourself up front, you can get by with a couple hundred bucks when you’re starting. And finally, it’s scalable. You can establish repeatable processes, you can farm those out to a team of people or selectively source specific elements and you can grow and maintain multiple properties simultaneously. I want to insert a caveat here around that last point… When you’re starting out, you should seriously spend the first 18-24 months focusing on your primary site to get the kinks out of your process, but also to establish a solid foundation. When you have everything humming along in that part of your portfolio, then you can start venturing out to leverage your existing business infrastructure to start another site. And these sites are real assets – like I said, these things sell for real money and there are people who invest real dollars in buying niche sites. There are two types of buyers: there are the asset investors and the renovators. Again, it’s very similar to the property market. You have people who buy properties to get long-term capital gains and in the interim, they take the rental income from the property for cash flow. Then you have people who look to buy assets with potential that they can do some renovation on and either grow the income of the property or flip it to realize their capital gain. Niche sites are the same – portfolio owners by strongly performing sites, they have management companies that feed and water the sites and keep things ticking over. You have other people who buy the sites because they see an underlying gem that with a bit more content or better link building that they can grow the site exponentially. It doesn’t require “passion” about the topic. Seriously, I hate businesses that require the owner to be passionate for it to succeed and these businesses almost always fail. I’m passionate about being successful, I like anything that I’m good at and delivers me a positive return in whatever way you want to measure it. When you start a passion business, you’re on a hiding to nothing most of the time. It is unlikely that you’re going to be successful out of the gate and to get things moving in the right direction, you’re probably going to take a lot of lumps and work really hard. I call that the “Passion Pain Point”. When you are passionate about something and you have to work hard on it without much positive reinforcement, it can become quite a down. It’s not hard to start resenting the thing you love. I have a great personal example. A woman I know LOVED baking and in particular, she was a savant when it came to making cupcakes and doing incredible visual designs. She got a bit of a windfall payout from redundancy at her job, borrowed money against her house which was fully paid off and opened a high-end cupcake store in a big shopping mall here in Sydney. For the first three months, business was good. She liked the validation and success she was having, but cupcake making had become a chore AND she was having to do all this other stuff like manage staff and deal with old inventory. At the six month mark, another cupcake shop opened up in the same shopping centre and one of the big chain patisserie shops in the mall started making “good enough” cupcakes and selling them for about 75% the price of hers. By the twelve month mark, she was losing money every single month, she couldn’t afford to maintain her commercial kitchen and was literally baking hundreds of cupcakes at home ALL NIGHT to keep up. She no longer had any kind of life at all that didn’t involve baking cupcakes, decorating them and dealing with the shop. Within 18 months she closed it down and lost about $400,000 in the process. Worse than that, she hated cupcakes – she told me a few months ago that every time she sees one she gets knots in her stomach. Her passion became her worst nightmare. With a niche site business model, you can be utterly dispassionate about it if you want. You are running a process business and investing in assets. Pretty straightforward, really. You’re looking at your business with an investors lens rather than someone who is letting their feelz get in the way. Now, here’s the thing… It’s not easy and it takes time. You don’t just sit down one day and say, “Hmmmm… I think I’m going to start a niche site on gardening” and in three days you’re making bank. I’ve told everyone who bought the Authority Matrix that it’s going to be six months of work before they even start to see strong positive signals and that’s IF they’ve done everything right. 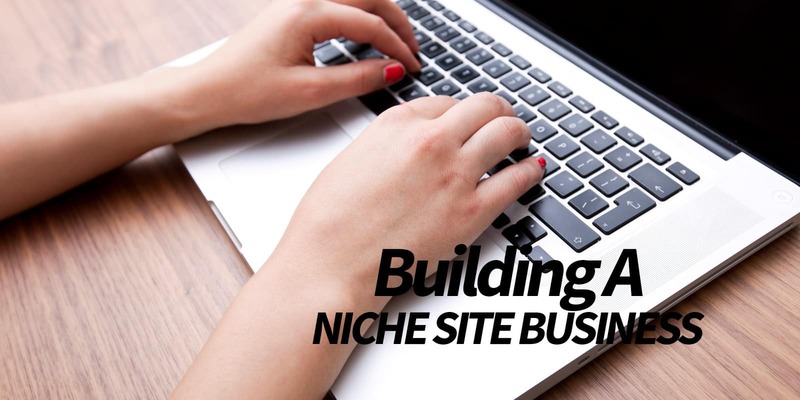 Nothing in life is guaranteed, that’s true of any investment, but if you want to build a portfolio style online business, then niche sites are a great way to do it.